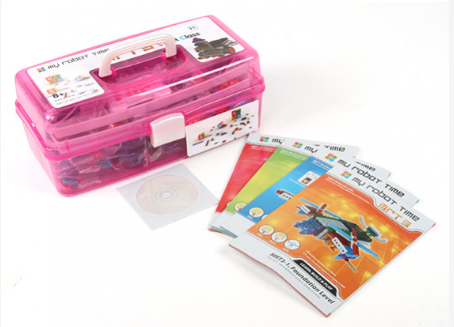 This robot kits has been devised to be an integral part of the Scientific, Technology, Engineering and Mathematics (STEM) curriculum and will provide a fantastic platform on which to build the skills needed to operate, build and ultimately design complex robotic machines with practical uses. Recommended for children aged 8 and up (not forgetting the mature students of course,) this set follows through all stages of the course from Foundation to Advanced to cover all of the elementary as well as the more advanced engineering and electronic concepts behind robotics through a series of modules and no less than 43 different models. Step by step building instructions are provided for each of these models that include simple, non-powered robots right through to fully-fledged battle robots. The models are built from snap together components molded from tough ABS plastic and incorporate a range of sensors (IR, photo, sound and touch) in differing configurations to demonstrate a range of capabilities and build a broad knowledge of their applications. The comprehensive manual forms the backbone of the course and is written in easy to understand language with clear illustrations to make following the course a unique and fun way to introduce robotics as well as extending general knowledge. This Educational Robot Kit contains all of the 4 modules in the series, making it ideal for schools and clubs. Each of the other kits in the series presume that the skills from the previous module have been acquired. As such, these products should be used in succession from Module-1 through to Module-4.